Clinical Instructor: Babak Parsad R.Ac. Method of Instruction: Lecture, Demonstration, Hands-on practice, Individual presentation, and patient case simulation, Final Exam. Basic Theory: Knowledge of Acupuncture Meridians, Point locations, Needling techniques, Moxibustion, Cupping; Basic Auricular, and other integrative acupuncture modalities and techniques; provincial regulations and the law concerning the practice of Acupuncture. Competency: of Medical Acupuncture point prescription protocols; Hands-on treatments / Practical competency; Clean needle techniques. Pictorial Atlas of Acupuncture: An Illustrated Manual of Acupuncture Points. Authors: Michael Hammes, Dr. Bernard C. Kolster, Yu-Lin Lian, Dr. Chun-Yan Chen. Edited by Hans P. Ogal and Wolfram Stor. H.F. Ullman, Publishing, New York, 2012. Color Atlas of Acupuncture: Body Points – Ear Points – Trigger Points. Authors: Hans-Ulrich Hecker, Angelika Steveling, Elmar Peuker, Joerg Kastner, Kay Liebchen. Theime, New York, 2008. Jurisprudence Course Handbook: Important Legal Principles Practitioners Need to Know. Richard Steinecke. College of Traditional Chinese Medicine Practitioners and Acupuncturists of Ontario. Toronto. 2012. Safety Program for Traditional Chinese Medicine Practitioners and Acupuncturists. College of Traditional Chinese Practitioners and Acupuncturists of British Columbia and College of Traditional Chinese Medicine Practitioners and acupuncturists of Ontario. September 2012. Additional handouts and notes will be distributed. 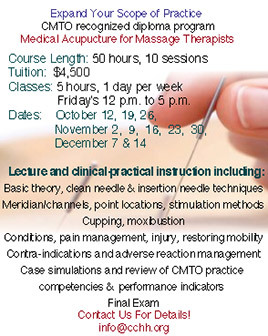 Upon successful completion of this course, students will be awarded a diploma in acupuncture. They are eligible for registration with the Ontario Council of Acupuncture & Chinese Medicine and the College of Traditional Chinese Medicine Practitioners and Acupuncturists of Ontario. Membership in these associations entitles the graduates to use the suffix C.Ac. and to obtain the required liability insurance for their practice. Completion also qualifies for recognition by the CMTO of 102 Category A CEU’s.